The reason is because a large room can sometimes seem cold and impersonal. For example, many people try to create an oversized conversation area within a large space. This results in too much distance between seating and so conversation is strained or limited. Use Up-lighting- Up-lighting will make a room seem taller. Use up-lighting as a backdrop for plants or a screen. Prevent Light From Flowing Upward- If light is kept from flowing upward, the room will appear cozier. Use darker lamp shades or low light sconces. Wash One Wall With Light- Washing a wall with light will make a room appear wider. Wallpaper or Paint Stripes- This decorating idea will make a room seem taller. Paint Walls A Cool Color- Applying very light, cool or neutral paint colors (blue, violet, and green family) to your walls will make the room appear more spacious. Create Two Conversation Areas- If you create two conversation areas in a very large room, this will make the room appear to be cozier overall. Conversation will flow more comfortably as well. Use A Tall Armoire- This is another great decorating idea for increasing the perceived height to a room. 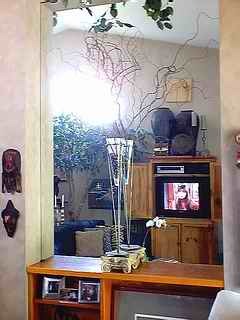 Hang Decorative Mirrors- Mirrors reflect whatever is in front of them. Try positioning the mirror so that it reflects a great view or something interesting. This will make your room appear larger. The mirror pictured below, in my living room, happens to be built-in, but notice the level of depth it provides. Thus making the room appear larger. Now, imagine the effect if that space was just some dumb wall. Hang Drapes/Curtains Higher- If you hang drapes above your windows, higher than usual, it will make the window appear taller and therefore the room. This is a great decorating idea for adding drama to a room and make a window seem more impressive. Lay Area Rugs- Lay area rugs to section off a large space. A beautifully patterned oriental rug can easily stand on its own as a transition piece from one side of a room to the next. The rug will do a wonderful job of creating the perception of two smaller, yet inter-related rooms. For tips on how to make a small room seem larger, watch this great video. If you'd like to explore some additional resources related to this topic, please check out the recommended resource links listed below. The Awaken Your Interior Designer! Collection - Featuring more than 1000 photos and 700 pages, this unique set of four home decorating and decor eBooks is filled with decorating tips about design style, color schemes, furniture, fabrics and patterns, window treatments, accessories, and more for each room of the house. Click here for more great ideas to help you with your home decorating! Do you know someone who could benefit from this decorating idea checklist for resizing a room? If so, click on the social buttons below to share.